In the ring, Renee Young welcomes “The Artist Known As” Shinsuke Nakamura. Renee starts to ask a question when Dolph Ziggler interrupts and heads to the ring. Ziggler “plays interview” by asking questions and not allowing Nakamura to answer. He then says that Nakamura is Michael Jackson in disguise. Nakamura then grabs the mic and asks Ziggler what his problem is. Nakamura translates into Japanese, ending by calling Ziggler a “jackass.” Ziggler attacks Nakamura, but Nakamura manages to turn the tables on Ziggler. Good match. I liked some of the counters in this one. Styles seemed to help Corbin look good in this, giving Corbin a lot of good offense. After the match, Kevin Owens attacks AJ Styles. Corbin joins in, but Sami Zayn runs to the ring to help Styles. Owens exits the ring, and Zayn hits Corbin with a Helluva Kick. Owens then attacks Zayn from behind and hits Styles with a pop-up powerbomb. Dasha Fuentes asks Charlotte about her title match tonight. Charlotte says that the queen needs a new kingdom to rule. She needs the SD Women’s Title to exist, and she is the greatest superstar in WWE history. An okay match, but I’m not a big fan of the Beat the Clock challenge. It makes the matches feel frantic, and this one was no exception to that rule. Gable kept looking at the clock, which annoys me, and everything in the ring felt rushed. New Day is coming to SmackDown Live. Soon. Earlier today, Rusev said he doesn’t like Daniel Bryan or Shane McMahon. He says that the only way he’ll wrestle for SmackDown is if he gets a championship match at Money in the Bank. Otherwise he will quit and go home. Dasha Fuentes welcomes Becky Lynch. Becky says she doesn’t agree with Charlotte’s methods, but she respects her results. Natalya, Tamina, Carmella, and James Ellsworth walk up and ask Becky where she stands. They threaten Becky then walk away. An okay match. There was a bit of violence in this one, but it was mostly pretty predictable. Also, I felt like Rowan didn’t sell the damage he was taking very much. Not a surprising finish either. This was just pretty average. After the match, Randy Orton gets on the mic and says that he might not know what a House of Horrors match is, but it will be Wyatt’s Hell. Jinder Mahal then comes out. He’s upset that Randy Orton is ignoring him. He accuses Orton of disrespecting him because he looks different. He then addresses “his people” in “his language.” Orton attacks Mahal, but the Bollywood Boyz help Mahal fight back. Mahal hits Orton with a cobra clutch slam, then takes the WWE Title and starts to walk away with it. Lana is headed to SmackDown, and she’s going to dance. During the commercial, Jinder Mahal and the Singh Brothers leave in a limo. Mahal is still carrying the WWE Title. This match felt a little more focused that the earlier tag match. The Ascension had a clear game plan going in to the match, and Breezango’s teamwork kept them in the fight. Even though it was about half as long, this was the better of the two matches. And the ending makes me very happy. Neville will dismantle Jack Gallagher on 205 Live tonight. Clips of the feud between Orton and Wyatt. Renee Young welcomes Naomi. Naomi doesn’t appreciate Charlotte “running her mouth.” Whoever is champ is at the top, and Naomi is about to make Charlotte feel the glow. This was a good match and a nice start for a feud between Charlotte and Naomi. I think they’ll have better matches down the road, but I liked this one. Naomi looked surprisingly dominant for most of the match, but Charlotte looked confident as well. The finish was unfortunate, but it’s a storyline ending so that’s fine. I didn’t expect anything to be settled in this match anyway. Natalya, Tamina, and Carmella run into the ring and attack Naomi and Charlotte (while James Ellsworth watches), ruining the title match. Overall, I think the show was okay. Some good and nothing bad, though not every segment was great. 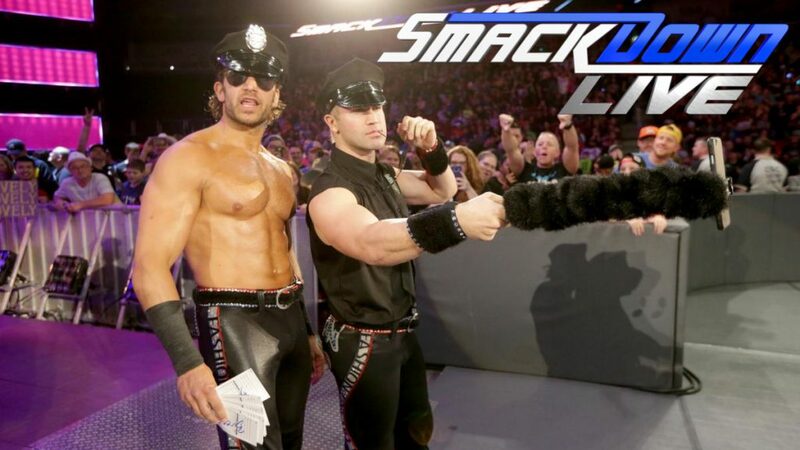 I like that Breezango are the new number one contenders. I just hope it goes somewhere. I’m not a fan of promoting three separate PPVs on one episode of SmackDown though. I don’t think any match on this show was great, and I’ve already expressed my distaste for Beat the Clock Challenges, but the finish of this one made me quite happy. For that, I have to pick this as the best match of the night.